"Is That a Plant in Your Pocket?" 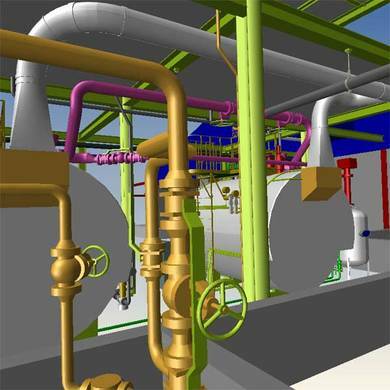 Viewing 3D plant designs no longer requires expert software. CAD Schroer’s MPDS4 Plant Design and Factory Layout software output and MWF Technology’s “On-Hand Viewer” iPhone / iPod touch app now make it easy for anyone to view 3D data on the go. Project engineers inspecting building sites tend to arrive well-armed with a large stack of technical drawings in order to review progress and ensure that installation construction is going to plan. Their job has just become much easier, with direct access to the latest project data – any time and anywhere. CAD Schroer’s MPDS4 software, combined with the “On-Hand Viewer” iPhone / iPod touch app, lightens the load by putting the latest 3D design data right on the phone in your jacket pocket. MWF Technology’s “On-Hand Viewer” allows users to download 3D plant or factory models exported from MPDS4 directly onto the iPhone or iPod touch via an ftp server. The application then provides a range of tools for navigating and even cross-sectioning the model. Thanks to easy access via WLANs or mobile Internet technology, users can take advantage of the software in practically any location. The lite version of the application can be tested free of charge by iPhone or iPod touch users, who then have the option of purchasing the professional app. The powerful, comprehensive MPDS4 Plant Design and Factory Layout software used to create these well-travelled models allows design engineers to plan, lay out and visualise highly complex installations. Because it is based on a relational database, the software handles a huge amount of data with ease. Support for all the plant design disciplines, from piping to steelwork to HVAC, extensive design automation capabilities, and integration with third party systems ensures comprehensive support for all project phases, from pre-sales concepts and visualisation to build order and documentation.